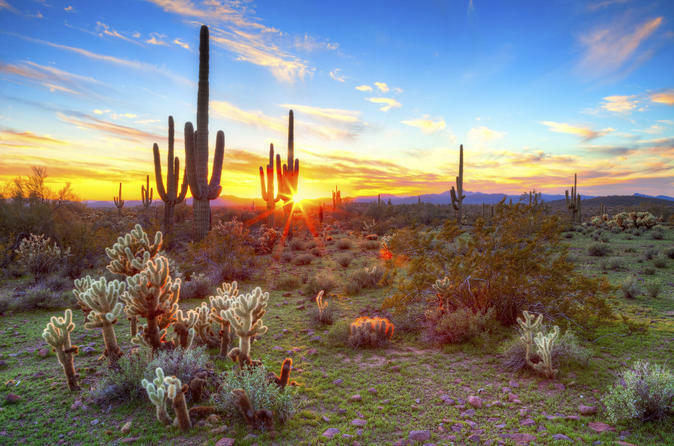 Experience the Sonoran Desert in a way few get to see it. Enter the desert after sundown as the creatures of the night stir. Let your informative and entertaining local guide show you the secrets of the evening desert and enjoy the excitement of a Hummer tour. Once the sun goes down, the Sonoran Desert becomes especially intriguing. Mountains that are rugged and majestic during daylight hours become dark, sleeping giants after sundown. The mighty Saguaro Cactus lives up to its reputation of being the "Sentinel of the Desert", standing guard as the creatures of the night stir from their day-long hibernation from the desert heat. Go beyond the boundaries of a regular jeep in the unstoppable Hummer as you travel deeper into the desert than an ordinary tour can go.